All orders are shipped via UPS and are fully insured. Please note that processing time prior to shipment is 2 days in most cases. All shipments are sent using standard UPS Ground which delivers in 5 to 7 business days. 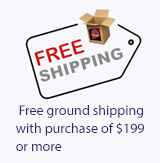 You may select expedited shipping at check-out for an additional charge. Options include UPS 2nd Day Air and UPS Next Day Air. Shipments may be sent using the US Postal Service in instances where UPS delivery is not an option. If you are sending your payment by mail, orders will not be processed or shipped until payment is received and funds verified. If paying by personal check, processing may be delayed by another 2 to 3 days. To begin immediate order processing, please make payment using a major credit card, debit card or PayPal.